It is difficult for a team to play on back to back nights in the NHL. To play two teams that have been hot of late like the Panthers and the Lightning takes a toll on a team both physically and mentally. The Capitals sure didn't look heavy of foot against the Lightning, but couldn't cough up a win in Tampa Bay. Honestly, I expected Lightning to blow out the Caps at the St. Pete Times Forum. The Caps had more chances to not only tie the score up, but come back and win. But it's the same old story for the Washington squad, they failed to capitalize on their opportunities. Of course the Caps are a miserable 6-31-6 when their opponent scores first. Come backs are not in the Capitals' vocabulary. Special teams again fail the Capitals as the last two goals the Lightning scored were a power play tally (on a strange penalty call on Alex Semin who threw the puck out of the zone and called for closing his hand over the puck) and a shorthanded goal. When the Caps pulled within 2 after a rare Matt Bradley goal, head coach Glen Hanlon pulled Olie Kolzig. Instead of the Caps getting the two goals they needed to tie the game, the Caps again found themselves down 3 goals after an empty netter from Jason Ward. There was no need to pull the goaltender, the Caps were still down two goals with only :54 seconds left after Bradley's tally. It wasn't a chance to tie the game. It was an embarrassing exclamation point the Lightning put on this win. Players remember those kinds of goals and they are moral busters. You can make it 4 games in a row the Capitals couldn't crack in to the three stars of the game. Welcome to the new NHL Em. When is a good opportunity to take a penalty? Yea, that would have been nice. Although, the Caps did kill 4 of 6 against the Panthers Friday night. They didn't stop the goals (tying and overtime winner) that matter. And he's the coach! He should know. Code for: "I'll let this one slide, but I better get a call next game!" The Capitals were called for 6 penalties, all infractions were committed by different players (Beech, Pothier, Jurcina, Semin, Morrisonn, Eminger). Four of the six guilty were defensemen. The Caps are second in the league for goals against in the second period, allowing 100 goals slip past them (only 73 goals for in the 2nd). Philadelphia is first with 102. Kris Beech was 28% in the faceoff circle. Compare that with Novotny with 57%, Gordon at 52%, Laich even at 50% and Clark with 80% (of players that took 4 or more faceoffs, Fleischmann and Brashear both were 100% after only one draw). Ovechkin, Semin and Potheir combined for 22:25 on the power play against the Panthers. They combined for only 2 points (both assists) with the extra man. All three averaged :50 or more per shift for the whole game. The last three goals scored by the Caps and Cats were all power play goals. Bad penalties, a horrible penalty kill and lost opportunities on the power plays. That sentence could be used to describe every loss the Capitals suffered this season. I am tired of hearing, "5 on 5 we were in this game," "We played well at even strength," "We are a tough team to beat when we stay out of the box." These lessons seem hard to learn. This game should not have gone to overtime in the first place, after what seemed a sure goal reviewed by the Comcast Sportsnet crew who had a shot of the puck over the line. But the NHL didn't seem to care, they just looked at the same replay over and over where you can't see anything, as if to say, "Does it really matter?" Even with that "non-goal" out of the equation, the Caps played true Capitals hockey of late: Lots of penalties and no power play. The Caps have not even showed up in the three stars of the game in their last three games. That hurts. It almost seems anything the Caps do are not worth wasting ink on. Not even on the scoresheet. Also, in the last four games the Caps have blown a lead. Chris Clark and Jakub Klepis scored both goals for the Caps and Alex Ovechkin got a pair of assists. On one power play, the Capitals spent a whopping 34 seconds setting up. I know, I counted. By the time they did get the puck in the zone and set up, nearly 45 seconds of their powerplay was swallowed up. It only took 21 seconds for the first shot (which went wide) and the Panthers cleared the puck, making the Caps spend another 30 seconds to set up another attack. Listening to the enemies' radio broadcast as I do sometimes, George Richards, beat writer for the Miami Herald, told the two Florida Panther announcers that the Capitals lacked any talent outside the two Alexes. I was surprise that I couldn't put up much of a fight to that comment. Richards also talked of a possible Panther run for the playoffs. Umm ... HAHAHAHA! Oh, (wiping tear) now that is funny! It’s that time of year in the National Hockey League. The games are starting to mean more with the playoffs in sight. A lot is at stake as teams start to position themselves for the hunt of Lord Stanley’s Cup. The hits have picked up too. There have been a slew of injuries and bad publicity surrounding the League going into this years post season. As the game becomes more physical, the importance of equipment still seems to be overlooked in the NHL. Players are getting hurt because of big hits and poor use of their equipment. Buffalo’s Chris Drury received 20 stitches to his head after being hit by Ottawa’s Chris Neil. The stitches and the concussion were less from Neil’s hit and more from Drury’s head slamming into the ice as a result from it. Drury’s helmet flew off with surprising ease when Drury’s head hit the ice. Capitals’ Donald Brashear, then resident tough guy for Vancouver, is used to getting a slash or a hit to lure the big guy into a fight. Marty McSorely’s slash to the head was no different. The swipe from behind by McSorely caught the enforcer off guard and he fell backwards. As he did his helmet slid forward easily, exposing the back of Brashear’s head as it slammed into the ice. These examples are a constant that I am seeing in the NHL. Players are not wearing their helmets as they should. Drury and Brashear’s helmets were too big for them. Their helmets slid off with ease. Players are sustaining injuries from wearing their helmets incorrectly. The more I paid attention to the situation, the more I have seen players wearing helmets that are too big, or too small. All helmets come with ear protection out of the box. It’s a small plastic shell that covers the ear and side of the head exposed by the rest of the helmet. But hardly any player in the NHL has them on their helmets. This isn’t a situation where the player’s equipment fails them, but rather they fail to wear their equipment in the right manner. Many times a player is hit heavily into the boards and their helmet slips forward or back, exposing the players head to the elements. It’s a common occurrence during any NHL game if one pays attention to it. Those hits could result in serious injury to a player that is wearing their helmet more for comfort rather than protection. In the NCAA Frozen Four tournament, it’s even more apparent that players are wearing their equipment incorrectly. Face mask’s, which are required in the college ranks, are always loose. They are rarely strapped to the helmet correctly, exposing the player’s chin and face and making the helmet loose and susceptible to flying off after a big hits and resulting in injuries. As the NHL considers tougher penalties for players hitting high to the head, it should also start mandating the correct use of the helmet. If Chris Drury’s helmet was fit on him, his helmet would have stayed on his head when he made impact with the ice. His injury would have been significantly reduced. The same with Donald Brashear’s helmet, and if he had the ear protectors, perhaps he would not been as stunned after McSorely’s slash, keeping the big guy on his feet instead of falling backward. Just about every helmet licensed in the NHL is adjustable to fit any size noggin. There really should not be any excuses here. Even enforcers, who usually wear their helmets loosely so they can slip off easily during a fight, should be made to wear their helmets correctly. Even if it’s to set an example to younger players that wearing hockey equipment in the right way is important and saves players from serious injury. I decided to take in a Capitals' practice today as I had nothing to do and it seemed like the cosmopolitan thing to do. I guess I showed up just in time. I hated myself for not taking my camera with me when the "incident" happened. The Caps were working on offensive and defensive positioning as they often do during practice. As the drill went along, the hitting sort of picked up and I noticed on more than one occasion that the Capitals defensemen were starting to get a little chippy with some of the wingers. Most of the chippy play was met with smiles and an occasional slap back of the stick by the forwards. When all of a sudden a commotion broke out at the top of the left circle in Olaf Kolzig's zone. Bryan Muir and Alex Semin were in a bear hug that turned into dropped gloves and a couple of thrown punches. It escalated rather quickly and both had started to pull the others' practice jerseys (that were logo-less for some reason*). Donald Brashear (a peacekeeper in his own right) was the only one to jump in and break the two up. Semin had gotten a couple of punches in and Muir mostly kept Semin at bay, not really wanting to fight him, but not wanting to back down either. The two finally stopped when Brashear and another defenseman (couldn't see who) pulled the two apart. Then both sat on the bench together putting their gear back on. Neither player was hurt. Neither spoke to the other as they sat on the bench (partly because Semin's English is probably better than Muir's Russian) and soon the drill dissolved into other drills. Both left the ice early at the end of the practice session and I am sure pulled aside by the coaches for a little talk. Now I feel like a total gossip reporting this, like a fight broke out on the school yard grounds and I just have to tell everyone because I was there. But it was this different side of Semin I have never seen before today. He earned a little more respect on my behalf. Semin could have slashed Muir, taken a cheap shot or a number of other things that I imagine him doing other than dropping the mitts. Instead, he stood his ground and dropped his stick and gloves and went at the biggest defenseman on the Caps blue line. The two were frustrated with the one another, they fought and then they moved on. Neither complained nor whined, but took matters in their own hands and cleared the air by going to fisticuffs. Most of the other players looked on in shock before Brashear broke it up (they were probably thinking what I was thinking, "Is this really happening? ", and "Is that Semin?"). The coaching staff said nothing, except continued the drill without the two. Let's hope some of that passion shows up against the Penguins. After things settled down, Shaone Morrisonn tried pick a fight with Brashear, jokingly knocking the big guy's stick from his hands and laughing at him (Brashear just smiled back probably thinking, "Just wait, punk"). Most of the other Caps sort of shrugged it off and were soon smiling and goofing off again with one another. Another downside to the Dainius Zubrus trade was evident during the practice today. Glen Hanlon had to try to explain to Alex Ovechkin what he wanted Semin to do. Ovie had to then translate to Semin. Hanlon obviously had to use his words wisely as Ovie is still learning the language himself. It seemed to take a bite out of the drill they were trying to do and slowed the pace. Normally Zubie would have quickly explained to the two what Hanlon wanted in Russian. *Editor's Note: Tarik's blog, Capitals Insider, picked up the answers to a couple of questions I had watching the team practice today, like why the jerseys had no team logos on them. The log jam in the Eastern Conference for that last 8th playoff spot has become theater for some high drama. Between 6th place and 11th in the standings is only decided by 5 points. This may not be decided until the final game of the season. In the thick of it are the Carolina Hurricanes, trying to defend their title, Montreal Canadiens and NY Islanders all tied for 8th. The Toronto Maple Leafs are still in the hunt just 2 points behind. Not yet guaranteed a spot in the post season are the NY Rangers and the Tampa Bay Lightning. The only team the Capitals have a hope of causing some trouble is with the Lightning when they face them March 31st. The Caps are down to just six games left in their season, facing the Florida Panthers (who will also miss the playoffs) a couple more times and Pittsburgh, Atlanta and Buffalo (last game of the season). While it is unlikely the Caps will be able to knock any of those teams out of the playoffs, their play could decide the order in east and spoil home ice advantage for some. Chris Simon offered to meet Ryan Hollweg to apologize for the slash that cost Simon 25 games. Hollweg declined to meet, and the media made more of the incident than the players did as the Rangers and Islanders faced off at Nassau. Too bad the two couldn't shake hands and maybe put the whole incident behind them. The Hockey News came out with a ranking of General Managers around the NHL. George McPhee was ranked 23rd, which I thought was generous. The Hershey Bears are the first AHL team to 100 points with their 44th win over the Binghamton Senators Sunday. The Bears are in prime position to reclaim their championship title as they close in on the playoffs. I am still waiting for that winning spirit to rub off on the big league team. Chris Bourque continues to impress with 47 points and 20 goals. It's unlikely he will see any NHL time this year, he is still my dark horse for making the team next year, or at least get some playing time in a Caps' sweater. Looking like the Capitals of last year, small moments of brilliance followed by a large lack of passion and/or experience. What frustrates Caps fans more than anything is that there so much talent on this team. For whatever reason, the Capitals can't use that talent to win games. The second period for the Capitals was bland to say the least (the very least). With the laser shot that Alex Semin has or the raw power of Alex Ovechkin, the Capitals seem unable to get very much mileage out of either of them this year. With little goal support for those two, the Washington squad can't just put all the pressure on scoring on those two. Although they seem content to. Olie Kolzig blocked aside 36 shots. The Caps were out shot badly for a second game 40 to 28 by Montreal. The Caps played a pretty clean game and was only called for three penalties. However, the Caps were 1 for six on the power play, and could not get any quality shots with an extra man. Chris Clark gets the lone Capitals' goal (the puck bounced off his shoulder on Semin's shot). The Caps had a few good chances late in the third, but were quiet most of the game (almost non-existent in the second). It's like they have lost all of their aggressiveness after the first goal. I talk of having that killer instinct all the time in the NHL and the Capitals don't seem to have much of it. Ben Clymer's season is done as he will have surgery to solve a sports hernia that has dogged him since October. Why didn't he have this surgery earlier in the year? This one just perplexes me. Clymer just played through the pain and was completely useless this season. Another great decision made by the Capitals management. Caps face the Penguins next, I don't expect much from the Caps in this one. The Pens are in a different place than the Caps are. I expect a blood fest and the Caps lucky to come out with a goal or two. It's gonna be ugly. What Are All Those Funny Looking Words? Here is an interesting exercise. Go to http://www.canadiens.com/ and look at the website in it's French form. I did today by accident and I was just about to call the doctor to ask about dyslexia. It was my wife who pointed out that I had accidentally clicked on the wrong link and was looking at the site in French. Just when I feel I have a healthy ego, something always knocks me down a notch. The Caps face the Canadiens in some very scary territory, the Bell Centre (notice the Canadian "re" in effect). Montreal would like to go to the playoffs, win Stanley's Cup, return glory to the Canadiens' legacy, prove their critics wrong and get a nice breakfast (hey, who doesn't want a nice breakfast?). The Caps are just the opposite, they are just looking to end the season on a high note. As always, the Capitals are looking toward the future. Prospects have to start coming into their own. They can play the role of spoiler in the Eastern Conference still with many teams. This means the Capitals must steal wins in places like the Bell Centre which is not easy to do. They must put forth a better effort than their last game. The Capitals need to start showing their winning side again when it matters most. That means making the Montreal faithful uncomfortable in their own home. These are the games that showcase the clutch players and give the Caps some momentum into the off season. The Games where the Caps can be spoilers are their own playoffs. Yup, my 250th post. I was hoping to get to 300 by the end of the season, but that didn't happen. I started this blog back in September of 2005 after reading a particular blog called Japer's Rink. Before that I had a piddly little geocities website that got very little traffic and was hard to update. I thought, "Well, if JP can do it, how hard can it be?" Little did I know of the joy and hardship of putting together well thought out posts about a hockey team that has done little since the inception of this blog. I named it Puckhead's Thoughts because Puckhead was a nickname I was given by teammates when I played and mostly because "Garrett the Ferret" doesn't really scream hockey blog for a title. I Guess The Capitals Can Practice Now - Opening of the Kettler Capitals Iceplex at the Ballston mall. Complete with video. Fearless Finals Prediction - I correctly predicted the NHL Finals with Carolina winning in 7 games. That won't happen for a while. Ok Colorado, You've Had Your Night - The most popular post on Puckhead. Featured on deadspin.com and sort of put my little blog on the map amongst other blogs. Okay, enough tooting my own horn. The race for the last coveted playoff spot in the eastern conference is making for high drama. The Capitals can play spoiler again against a team in the hunt. The Montreal Canadiens are knocking on the door of that 8th place spot held by Carolina. The Caps could make things a bit more difficult for that to happen. Earning official spots in the playoffs are Buffalo, Detroit, Nashville and Anaheim. No surprise here, but would like to see Buffalo steal the President's Trophy from Detroit. Todd Fedoruk's season has ended after taking a shot from Colton Orr during a fight in the Flyers/Rangers game. While this was a "clean" fight, NHL still has to face it's critics that the sport is too violent. My only response is that it's late in the season, guys are playing with sprained joints, bruised bodies and beat up faces. An 82 game schedule takes a lot out of a player physically. Fedoruk could have been able to withstand a hit like that earlier in the season. But when the body is worn, it's at it's most vulnerable. That has to be a NHL record. One shot, one goal, all in one period. Alex Ovechkin's goal made the Capitals perfect in the first period, and they had no other shots for the rest of the period. The Caps nearly pulled off an upset when two games back to back caught up with them early in the third. The Hurricanes are fighting for their playoff lives, the Caps aren't. The 'Canes were throwing everything at Brent Johnson, who looked very good in the net. Let's be honest, I was more shocked the Capitals were ahead at the end of the second than the Hurricanes two quick goals (both goals were thirty seconds apart) to tie and then lead at the start of the third period. Ovie scored twice and Chris Clark scored a power play tally in the second after the Caps allowed a shorthanded tally by Carolina early in the powerplay. Jiri Novotny found the scoresheet twice with a couple of assists (albeit secondary assists). The Caps did alright, considering this was their second game in two nights. They responded well against a team that needed a win, badly. The Capitals came into this game tied for third in the league for first period goals. The first period for the Capitals has been a positive this year, but the Caps need to pull together a full 60 minutes. It always seem to be some goal, some play or some penalty that turns the Caps fortunes sour. Then they just can't recover. Shots were tough to come by for the Capitals because the Hurricanes were so good defensively. Caps only were able to muster 10 shots for the game, the Hurricanes slapped 39 against Johnson who turned away 35 of them. Not to state the obvious but, the Caps needed more shots on net. The Penguins come to call against the Caps on Tuesday. Crosby vs. Ovie blah, blah, blah. Penguins in the playoffs and blah, blah, blah. Pittsburgh is going to build a new arena, blah, blah, blah. Editor's Note: Tarik El-Bashir answers my question on one shot in one period. Two things hurt the Capitals this season, their penalty kill and injuries. Those two issues seemed predominant plagues in this game. The Sabres took advantage of their extra man opportunities and the Caps missed the speedy Matt Pettinger. Donald Brashear had himself quite a night with a goal and a fight, a knock out with Andrew Peters. The Caps seem to depend on him more for scoring than enforcing. If a team can put their minds to it, it has been easy to shutdown both Alex Ovechkin and Alex Semin who were both held pointless. Brian Potheir scored the Caps other goal. Dainius Zubrus didn't waste much time to stick it to his old team, getting a pair of assists. While it was hard to see Jiri Novotny anywhere on the ice (who the Capitals traded the former for the later). Daniel Briere also took advantage of an inexperienced team scoring two including a cute wrap around that slipped past Olie Kolzig (who looked a little slow to recover on more than one occasion). The Caps seem to turn over the puck an inordinate amount of times, possession is key against a team like Buffalo. Bad passes, blind passes, and just being weak with the puck all lead to the demise of the Capitals. Most of that you can tack to in experience (the phrase of the year), but it wasn't just the young players turning it over. Capitals have to find their offense again against Carolina (another reoccurring phrase on the season for the Capitals.) With the Hurricanes stuck in a tie for eighth place, the Caps must be at their best, because Carolina will be at theirs. Alex Semin scored a natural hattrick (the second Caps player to get one since Olie Kolzig's return) and Thomas Fleischmann broke out of his shell for a 2 goal, 2 assist game. The Caps pounded Tampa Bay right back to Florida. During the whole game I couldn't help but think about what numbers were different since Kolzig's return. So ponder no more. The thirteen games Olaf Kolzig was injured, the Caps had 373 shots for and 30 goals. They had 395 shots against them, and 47 goals squeezed by the back up Caps goaltenders. In the past 3 games with Kolzig back in net, the Caps have 96 shots for and 15 goals. They have 107 shots against and only 5 goals allowed by Olie (just a single goal for each opponent in the last two games). The Capitals without Kolzig had a .076 winning percentage. Brent Johnson and Fredric Cassivi both combined for a .881 save percentage during that stretch. Since Kolzig has returned, the winning percentage for the last three games is .666% and he has a .953 save percentage. Fleischmann had two assists and was a -6 playing in 9 of the 13 games Kolzig was out. In the last three games he has 5 points and has a +5. Semin is similar, with a -7 during the injury and is +5 after. Home attendance at the phone booth since the injury over a span of 6 games averaged out to 13,345. Since Kolzig's return, two home games with an attendance average of 15,277. That is some interesting stuff to ponder. Caps and Lightning face off in a matinee match up at the phone booth. The Capitals are coming off a rout of the Toronto Maple Leafs while Tampa Bay fell to the Buffalo Sabres at home. The Lightning need to stop this recent bleeding if they want to take over the top spot in the Southeast, while the Caps are "playing for pride" (according to ESPN). With Olie Kolzig in net, it seems that the Caps have some new life. Alex Ovechkin is still in sight of the NHL's top scorer, if he can get his inconsistencies ironed out. Now that he doesn't have to play defense as much with a more talented goaltender in net, maybe Ovie can get some good shots off. Ryan Hollweg will not press charges on Chris Simon for his stick work which earned him a 25 game suspension. I know what Simon did was wrong, and anyone who chops at some one with their stick should get the book thrown at him. Having said that... what was Hollweg doing skating back to Simon after the hit? It was obvious the play was no longer there. Hollweg went back looking to draw a penalty (which he got). If Hollweg joined the play, like he should be doing, this would have never happened. Just play the game guys. Congrats to Mike Modano for becoming the highest scoring player in the NHL born in the U.S. If there was ever a good role model for young kids in the States, Modano is that role model. Talk about your all time bad trades. The Phoenix Roadrunners trade a good player for a couple of duds. Must have gone to the George McPhee school for general managers. Okay, it has nothing to do with hockey, but there was a three-way tie on Jeopardy. What are the odds? My wife and I are like a little old couple and find ourselves eating dinner and watching Jeopardy. It's sad I know. What a difference Olaf Kolzig makes in net. It's quite clear what kind of team the Capitals have without Kolzig in net. The Caps need that injection of leadership back in net to look like a semi-normal team. Alexandre Giroux scored his first NHL goal off an weird bounce that confounded Andrew Raycroft. Also scoring for the Capitals were Alex Semin, Boyd Gordon, Kris Beech and Thomas Fleischmann. Alex Ovechkin was actually held pointless in this one. Where were these hot hands a month ago? For the Capitals to have success they need more goal support which they enjoyed against the Leafs. Milan Jurcina continues to impress me with his play, making the most of his new start in a different uniform. Since being traded from the Bruins, Jurcina has been a physical presence and has been pretty good with the puck. The Capitals face Tampa Bay on Sunday. Let's see if they can continue this little streak, it would go a long way to get a few solid wins under the belt before making those tee times. Even if you spot the Capitals a three goal lead, they blow it. It was 3-0. In a span of 2 minutes and eleven seconds the Bruins stormed back to tie the game. The Capitals were ahead 3 -nothing and they couldn’t stay out of the penalty box. The Bruins get it all back on power play goals. The Caps were ahead by three goals and pitching a shut out. 3-0! It didn’t matter that Chris Clark scored a natural hat-trick. It didn’t matter that Olie Kolzig made a spectacular return to net after missing 13 games due to injury. It didn’t even matter the Alex Ovechkin seemed to get some of his bite back. Those should have been the stories of the game. Instead, the Caps blow a 3 goal lead and drop their ninth straight. Steve Eminger’s penalty at the end of the second period absolutely bothers me. I have seen so many players do this. They go for the stick check and are too aggressive with it and end up high sticking the other player. It doesn’t take much to stick check someone, you do not need to pitch fork like that. I have never, ever, high sticked another player in that fashion and successfully stick checked even the best players. A player must always stay in control of their stick. Eminger’s pitch fork stick check put the Caps down two men. And the Bruins took advantage. They scored on the two man advantage, then on the 5 on 4 power play that ensued. Caps fans scratch their heads, and stop watching (and watched VCU take out Duke in the first round of the NCAA tournament - Go Rams). The Bruins took this game to where the Caps dreaded most, the shoot out. Even with a rare Ovechkin goal in the shootout, Phil Kessel put the game away. The Caps now slide to nine straight losses. The Capitals always manage to ruin their own successes. This game was no exception. I was trying to think of who the Caps play next when I realized, do I really care? Nine straight losses, it doesn't matter who they play next. Can you hear that sound? It's the sound of the season ticket printers for next year. I don't hear them either. It's a pretty funny and cool ad. 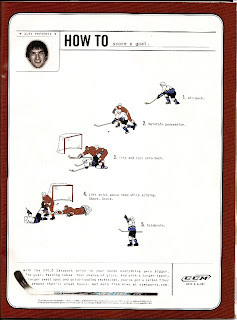 It breaks down how to score a goal, or rather the goal. Apparently, it only takes 5 steps. Who knew it was so simple? It makes me want to spend $250 on a fiberglass stick. My magazine also contains an article about Neil Henderson who has been giving the youth of D.C. a chance to learn the game of hockey, and the game of life. It's a good read and can give you better understanding on how hockey changes lives. The Ft. Dupont program deserves a lot of recognition by the hockey community in the D.C. area. In other news, Olaf Kolzig is back in net, and not a moment too soon. With an injured Brent Johnson, the Caps were just about out of goaltenders. Still remains to be seen how heeled the knee is for Olie. If the Caps can ride Kolzig to the end of the year, they may pull out some big wins down the stretch. That is if Olie can get his timing back. Not even a pair of goals by Alex Ovechkin could raise the game of the Washington Capitals. They lose, again. The Caps drop their 8th straight and officially have the worse record in their last ten games in the league (1-6-3). The Capitals seemed destined to end the season last place in the Southeast for the third season in a row. Now this team is nothing more than stepping stones for teams positioning for the post season. They looked like a stepped on team as well. Two bad turnovers by Capitals’ defensemen lead to softie goals. It seems like the Caps are content on shooting themselves in the foot night after night. Fans complain of management overlooking juicy free agents for prospects that don’t seem ready to play in the league and I am starting to buy their arguments. Goaltending is an obvious problem. You never really know how good Olaf Kolzig is until he is injured. Brent Johnson just looked uncomfortable in net, Fredric Cassivi wishes he was back in Hershey (at least they have a winning team). Defense is young and very thin. The talent on the blue line always looks a step away from being great. But they also have games like this, giving up bad turnovers. Mike Green suddenly has hands of stone and opponent teams are bearing down on the inexperienced d-man. Offense looks like a mess. There doesn’t seem to be any lines that are working well together. Lines change more than Ellen Degeneres’ outfit on Oscar night. Donald Brashear is getting time on the top line, something is wrong with that. The Capitals can not just allow division teams to man handle them. You can afford to lose every non conference game and half of your eastern games, but if you can’t win against your division rivals, forget it. Pack it up, because you are not going anywhere. So that’s it, the season’s done with 12 games left to play. Capitals will start looking at some of their younger players to see who is ready to play in the majors next year. GMGM is making his golf plans already, and Ted Leonsis will talk about the few bright spots of the year and ask for you to re-up for next season. Selling season tickets is all the Caps have left to do. Even that seems an impossible endeavor. I missed a few games and had the chance to watch the tapes. I tried to come up with some explanation for the lack of punch in the Capitals game. One thing just keeps running in my mind about the Capitals' woes. There is nothing special about them. In the Leafs game, the Caps played pretty solid 5 on 5, but that just seemed good enough for the Washington squad. For all that talent, the Capitals have suddenly had an offensive cramp that it can't seem to shake. There is no catalyst for the Caps' offense, no spark, no life. It looks as if everyone is just waiting for someone else to take the lead. Alex Ovechkin can't do it alone, and teams have learned to shut him down. Glen Hanlon and the coaches don't seemed bother by it, or make an issue of getting the Caps phenom more open ice. They seem content on letting Ovie skate into a stacked defense with little or no help. For the entire season I have watched teams stack their defenses against Ovie, isolating him to the left side of the rink. It plays over and over every game. Ovechkin can't seem to break out of that play, and the coaching staff seems to ignore it. I know they are ignoring it because I see it every game. Every game. But what else really stuns me about this recent game, everyone on the Capitals squad seemed invisible. In contrast, the Maple Leafs' Darcy Tucker, who is not the most talented player in blue and white, generated chances and became a catalyst for the Leafs' offense. There is no player like that for the Washington Capitals. Everyone looks as if they are going through the motions. "We're playing some young kids, and we've improved defensively but, as you could see, we're challenged offensively. We've got to at least generate something on the power play, and that didn't happen either. Give (the Leafs) credit. They did well on the penalty kill, and scored some goals when they needed to. They were patient." --Glen Hanlon after the Leafs game. "Five-on-five, we played pretty well. We took some penalties and got behind the eight-ball. We're missing some key penalty kill guys and when you lose those guys out of your lineup, it obviously hurts." --Brian Sutherby after the Isles game. Both quotes are steeped with excuses, but no answers. That is what bothers me. Players get hurt in the NHL, it's a fact that this game taxes the bodies of players. The attitude of this team is sinking lower and lower. Soon this team will be a bunch of individuals trying to play a team sport. For the first time, I am starting to doubt the coaching of this team. It's that lack of something special to break this monotony of drab play the Caps seem accustomed to playing this season that plague them. Even with good 5 on 5 play, the Caps are just not getting it done. In a part of the season where a team should be playing its best, the Caps are playing their worst. Do you remember the ESPN promo for the Stanley Cup Playoffs where Mike Richter was taking shots from the point and he let a puck get by him and hit the clear plexiglass covering the 6’ X 4’ opening of the net? This shootout reminded me of that with Brent Johnson basically letting shots get behind him. But the shot either hit the post, or slipped wide. Johan Holmqvist and Johnson were spectacular in the shootout, and it came down to one shot off the stick of Nick Tarnasky (never heard of him either). In a 10 round shoot-out, the Caps just couldn’t catch a break. It’s almost not worth this team to pull the goaltender to tie the game late, because they just can’t win in the shoot out. Even Donald Brashear could not get the Caps their second win in the shoot out. The crowd jumped to their feet when they saw the Capitals’ enforcer take the ice. The biggest save of the game was not made by either Holmqvist or Johnson, but Gord Dwyer (one of the on-ice officials). The Caps had pulled Johnson and the Lightning had the chance to shoot on net when Dwyer, trying to skate out of the way, got in the way denying the empty net goal. Jiri Novotny started in his first game with the Capitals. He had an assist on a wide open Alex Ovechkin goal. Ovie had a goal and an assist. Shaone Morrisonn is on fire scoring his third goal of the year, but his 2nd goal in five games. That is pretty good considering he hadn’t scored in 43 games before that. The Caps lost Matt Pettinger and Boyd Gordon to undisclosed injuries in the third. This was a pretty entertaining game. From here on out, all the Caps games will be just that, entertaining. Their chances of making the playoffs seem insurmountable. The Capital can however start dashing the hopes of those who want to make the playoffs. Much like they did against the Thrashers a year ago. And to do that the Caps have to start scoring with more consistency. Caps will face former friend, now foe, Richard Zednik and the new look Islanders. The Islanders are playing for their playoff lives. It is a perfect opportunity to for the Caps to become spoilers.